Remember this demo I posted from the Google I/O of the amazingly stable flying drone sporting 2 video cameras on-board? The one you can remotely control with your Android phone? As there was no price for this future Christmas gift list topper announced yet besides the "couple hundred dollars" range, all we could do was guess. 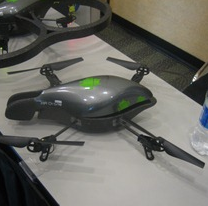 We’re happy to announce that Parrot AR.DRONE US street price and release date will be revealed at E3, June 15th. THANK YOU ALL and see you at Parrot AR.DRONE LAUNCH at E3! What do you think the price would be? Remember - it has 4 propellers, 2 cameras, and interchangeable "skins". It was an absolute hit at Google I/O. Can your wallet handle it this holiday season?